The City of Mississauga Official Plan and Port Credit Local Area Plan (PCLAP) identify land near the Port Credit GO Station as being important to further the development of the Port Credit Mobility Hub. A Master Plan is required to ensure a successful transformation of this area. On September 28, 2016, Mississauga Council adopted Official Plan Amendment No. 55 to update the Port Credit Local Area Plan policies to reflect the recommendations of the Port Credit GO Station Southeast Area Master Plan. On July 7, 2016 via Resolution 0135-2016, Mississauga Council approved the June 27, 2016 recommendation of the Planning and Development Committee that the amendments to Mississauga Official Plan proposed in the report titled "Report on Comments (Ward 1) Port Credit GO Station Southeast Area Master Plan Implementation - Proposed Changes To Mississauga Official Plan" dated June 7, 2016, from the Commissioner of Planning and Building, be approved. NOTE: City staff continue to dialogue with Metrolinx on issues related to the size of the parking structure, and City review of development proposals for the Port Credit GO station southeast parking lot. Metrolinx, with the assistance from City staff, retained IBI Group to prepare the Master Plan. Please click the links below to view the document. 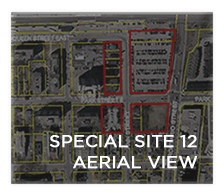 A Master Plan is being prepared for lands south of the Port Credit GO Station (identified as 'Special Site 12' by the Port Credit Local Area Plan). The Master Plan is to address, among other matters, land use, built form, transportation and heritage. A consultant team from IBI Group has been retained by Metrolinx, one of the landowners, to lead the study process and to coordinate with the City of Mississauga. 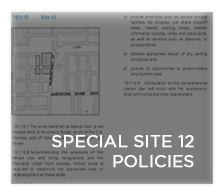 The Master Plan is a requirement of the City’s Official Plan policies and must be completed in advance of any new development. Metrolinx and its division GO Transit has plans to build a new parking garage for GO Transit users and mixed-use development. Your participation in this Master Plan Study is important and we welcome your input. An Advisory Panel has been established and agendas, handouts and minutes from the meetings will be posted on the City’s website. Information presented at the Open House, with some minor revisions and supplementary information is posted below. A small Advisory Panel has been formed to act as a "sounding board" for some ideas. Information presented and minutes from meetings are posted below.